Dr. Robert King Stone was the Lincoln family doctor and one of 350 witnesses to give an account of the events of April 14, 1865. Dr. Stone recounts his experience with the dying Lincoln on the night of the assassination. Stone includes a description of Lincoln's fate and the care he received in his final hours. Q. State to the Court if you are a practicing physician in this city? Q. Were you, or not, the physician of the late President of the United States? A. I was his family physician. Q. State whether or not you were called to see him on the evening of his assassination, and the examination which you made and the result? 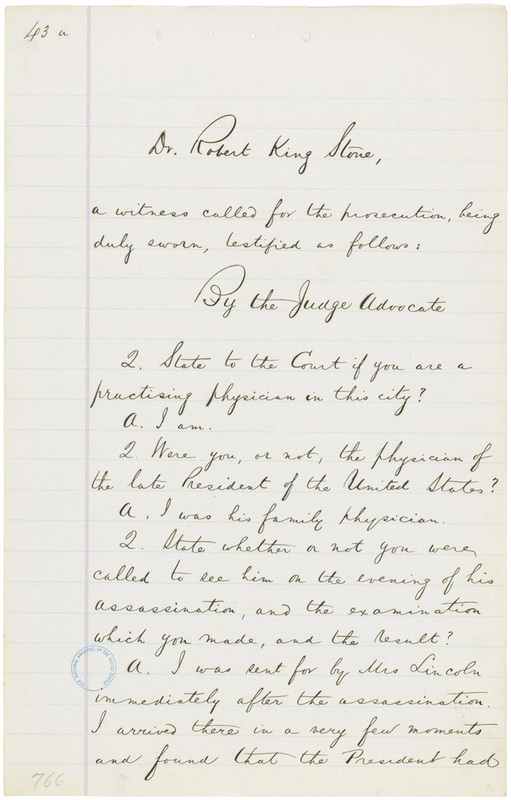 A. I was sent for by Mrs Lincoln immediately after the assassination. I arrived there in a very few moments and found that the President had been removed form the theatre to the house of a gentleman living directly opposite the theatre, had been carried into the back room of the residence, and was there placed upon a bed. I found a number of gentlemen, citizens, around him, and among others two assistant surgeons of the army who had brought him over from the theatre and had attended to him. They immediately gave over the case to my care, knowing my relations to the family. I proceeded then to examine him, and instantly found that the President had received a gunshot wound in the back part of the left side of his head, into which I carried immediately my finger. I at once informed those around that the case was a hopeless one; that the President would die; that there was no positive limit to the duration of his life; that his vital tenacity was very strong, and he would resist as long as any man could, but that death certainly would soon close the scene. I remained with him doing whatever was in my power, assisted by my friends, to aid him, but of course, nothing could be done, and he died the next morning at about half past seven o'clock. It was about a quarter past ten that I reached him. Q. He died from that wound? Q. Did you extract the ball? A. Yes, sir. The next day, previous to the process of embalmment, with some medical friends, Dr. Curtis and Dr. Woodward of the Army, and in the presence also of Surgeon General, Dr. Barnes, the examination was made. We traced the wound through the brain, and the ball was found in the anterior part of the same side of the brain, the left side, - a large ball resembling those balls which are shot from the pistol known as the Derringer; an unusually large ball; that is, a larger ball than those used in the ordinary pocket revolvers. Q. Was is a leaden ball? A. Yes, sir, a hand made ball, from which the tag on the little end had been cut by hand. The ball was flattened somewhat, impressed in its passage through the skull, and a portion had been cut off in going through the bone. I marked the ball with the initials of the late President, and sealed it in the presence of the Secretary of War in his office, - sealed it with my private seal and endorsed it with my name. The Secretary enclosed it in another envelope which he endorsed in like manner and sealed with his private seal. It is still in his custody, and he ordered it to be placed among the archive of his department. Q. Was the ball slightly flattened? Q. Did you see the pistol? A. No, sir, I did not. I may state that I marked the ball with the initials of the President, "A, L", so that I could recognize it instantly. Q. [Exhibiting a ball to the witness.] Look at that ball and tell the Court whether it is the one which you extracted from the head of the President? A. It is. I recognize the mark I put upon it with my penknife, "A. L", and the shape of the ball. This is the fragment of which I spoke, which was cut off in its passage through the skull. The ball was flattened as I described it to the Court. Q. You know nothing in regard to the pistol? A. No, sir, I never saw it.